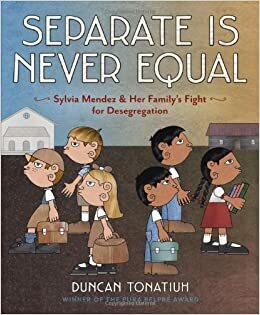 I received my copy of Duncan Tonatiuh’s new picture book, Separate Is Never Equal, the other day. This book presents the true story of Sylvia Mendez, a Latina elementary school student, whose family and neighbors successfully challenged Anglo/Mexican segregation in California schools in the 1940s. Sylvia Mendez (center) and artifacts of Anglo/Mexican segregation and integration. Back then, many districts forced dark-skinned Mexican-American students to attend dilapidated, underfunded schools, while white and lighter-skinned Mexican-American children enjoyed well-kept buildings, new books, and better educational opportunities. (One might argue that many students of color face the same inequities today, but that’s a different subject.) Fortunately, the families’ lawsuit against the district was successful, and the schools were integrated. After I read the book, I knew I had to share it with Araceli (pseudonym), an 11-year-old Latina aspiring civil rights lawyer. Having lived for years in a neighborhood affected by poverty and racial tension, Araceli has vowed to commit her life to social justice. Instead of just ignoring the problems that surround her, she wants to make a difference now and as an adult. So, I wasn’t surprised when she devoured Separate Is Never Equal. Decides whether he/she can be like that prototype. One of Separate Is Never Equal’s great strengths is its introduction of a young, Latina, activist prototype – something that we don’t see very often in children’s literature. Most justice-themed books that I know of have focused on male civil rights leaders – Mahatma Gandhi, Martin Luther King, Jr., Malcolm X, John Lewis, César Chávez – and, of course, these books are vastly important; however, children need to see even more diversity in justice-themed literature so that they can have role models who share their cultural and experiential backgrounds. All children, regardless of their age, gender, or cultural/ethnic background, need to know that they can stand up for social justice. This collage is beautiful. Let’s add to it! Another feature of this book that I greatly appreciate is its focus on Anglo/Mexican segregation and civil rights, a facet of U.S. history that is often ignored. I grew up in Texas and never once remember hearing about these dark days in the Southwest. Instead, we only learned about Dr. King and African-American Civil Rights, and while kids obviously should continue learning about that movement, they also need to know about other struggles for social justice. So, if you’re a teacher or parent, I urge you to carefully select children’s literature, like Separate Is Never Equal, that provides the kids in your life with social justice role models from various backgrounds. You never know who you’ll inspire! clarity, and prototype matching. Personality and Social Psychology, 65(4), 769-780. Tonatiuh, D. (2014). Separate is never equal. New York, NY: Abrams. Marianne Snow, a former early childhood teacher, is currently working on her PhD in literacy education. Her research interests include Latin@, Latin American, and nonfiction children’s literature. In her spare time, she blogs at Getting Critical with Children’s Literature about books, critical literacy, multicultural education, and social justice issues. I’m so glad to see that someone has done a children’s book on this important chapter – and person – in civil rights history. Like you Marianne, I lived in Texas as a child (just a few decades before you (-:). Our school was a segregated White school; the migrant workers children went to it when they were in town for a harvest. Some of the teachers were so cruel to those children that it still makes me cringe. Thank you for sharing this book!